Back in the Philippines | Walk with us! Fr. Johnny with Van, one of his students. As noted with his last post, Fr. Johnny Klingler, who has been in the Philippines for the past several weeks teaching English, represented the U.S. Province at the funeral for Fr. Tom Fix in Indonesia. Fr. Johnny writes the following after having returned to the Philippines from Indonesia. May 6, 2012: I left Palembang, after some six hours of sleep, in the early morning hours of Tuesday, April 24, the day after the funeral for Fr. Tom Fix. I arrived in Jakarta at St. Joseph Home and spent a quiet day with Fr. Aloysius, the coordinator of St. Anthony’s Schools in Jakarta. Fr. Aloysius met me at the airport when I arrived early in the morning on Monday. He took very good care of me, arranging transportation and a place to stay while I was in Palembang and Jakarta. He and the cook, Tonto, fed me well. I spent the day taking it easy and catching up on my email. 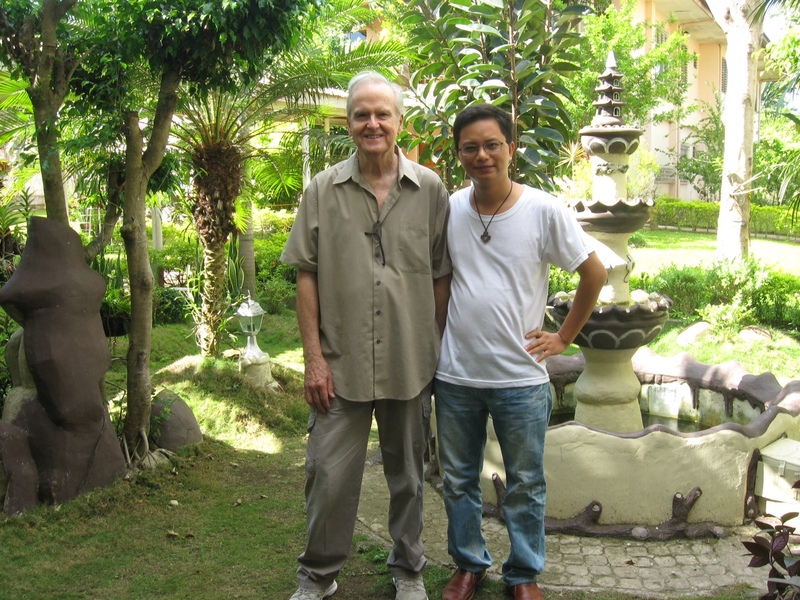 Wednesday I visited with Pat Houterman, a former member of our community who continues to live in Indonesia. We went to lunch and caught up on our lives over the years. Pat is the co-director of a private English language school in Jakarta. He and his wife Jane are both doing very well professionally. It was a joy to see him after so many years and to see him healthy and happy. I left Jakarta on a 12:30 a.m. flight to Manila. I have never taken such an early morning flight. I was surprised that the plane was full. I would have the second day of four days of travel with no sleep. Fr. Johnny visited the Divine Mercy Shrine with Fr. Andrew Sudol. I missed four days of the third week of school so I felt I had to teach on Friday. I made it through the day and on Saturday I was able to go with Fr. 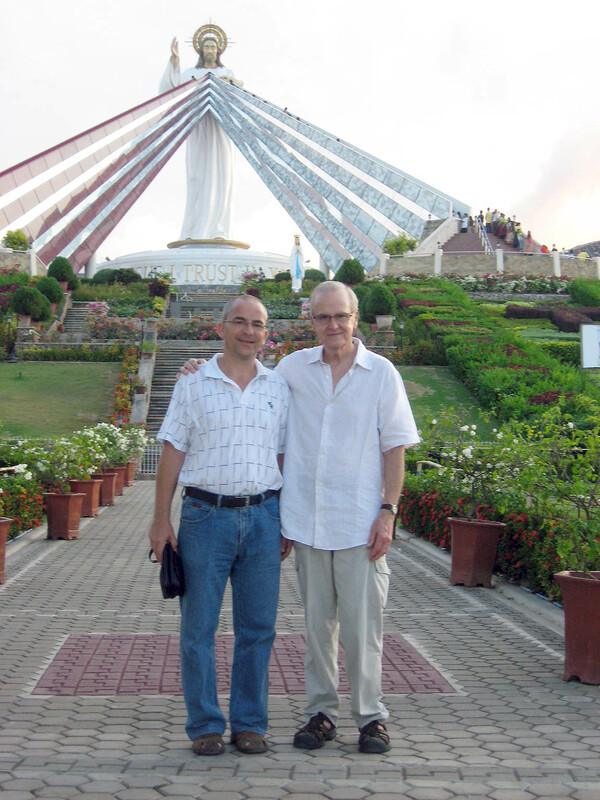 Andrew to see the Shrine of Divine Mercy in El Salvador. As you can see from the photo it is “unique.” It was late in the day when we arrived so there were few pilgrims. Fr. Andrew, two of his priest friends and me went out for a fish dinner in the evening. A small dish with two small peppers was given to each of us. I was told, or so I thought, to put lemon juice that was on the table on the peppers and eat them. I took one of the peppers and began to chew it but no sooner did I do this that my entire mouth went on fire. I could hardly talk. I gulped down beer to put the fire out but to no avail. The pain lasted about 10 minutes. What I was supposed to do was to use the sauce with the peppers as a dip for the fish I ordered. The third week of school was spent building vocabulary and pronunciation. During one morning’s class we watched the movie “Romero.” It was very useful as the film was English and there were sub-titles also in English. We had a discussion together about the movie in the afternoon class. That evening the professed community went to our SCJ parish of The Immaculate Conception for a going-away party for Dn. Showe Reddy. He is going to our parish in Kumalarang. It was a very nice gathering. There are three SCJ priests who minister at Immaculate Conception. Fr. Jan Krzeysciak, who has been here in the formation community, will join the parish team. The meal that the community provided was very good. When I saw that pasta was one of the main dishes, I was very happy. Tuesday, May 1st, was Labor Day, a civil holiday. The community spent the day at Marvellia Beach in Opol, which is only a 40-minute car ride from the city. It was a very hot day so one had to be very careful not to sunburn. The following evening we had a farewell gathering for Fr. Szymon Bendowski, who was leaving here to minister in our parish of St. Isidor in Dumalinao. The students worked hard this past week. I can see the progress they are making. As I mentioned before, they are very eager to learn. They have to pass an English exam in order to begin the study of philosophy at St. Xavier University. This is a big motivation in itself for them to learn. Yesterday, Saturday, May 5, I went with Fr. Andrew, Jona (secretary to Fr. Francis), and a friend of the community to Forest Garden Adventure Park in Dahilayan, a one-and-a-half drive to the mountains. The air was so “fresh,” as the people describe it, and the temperature easily can be10-20 degrees cooler. It was a big change for me from the city. I can understand why it would be popular for families to picnic and to enjoy the many adventure rides. This morning I celebrated the Sunday liturgy for the students as all the priests were helping out in parishes. I had a two-hour nap in the afternoon, which is most unusual for me. Perhaps the reason was that air-conditioning was installed in my bedroom and office a few days ago. Tomorrow, Fr. Andrew will go to our seminary in Aluva, India, to give a ten-day retreat for those taking final vows.